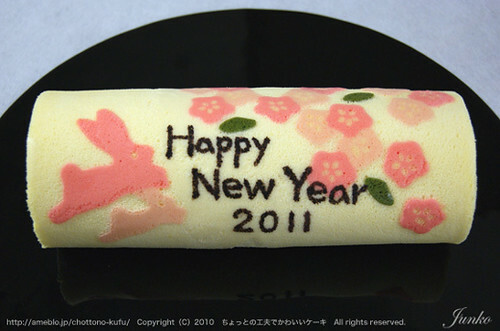 A simple roll cake made from sponge cake wrapped with cream. If you think decorating the cake is difficult, with a little ingenuity you can make this cute decorated roll cake! Junko, who created a recipe book called “Let’s make deco-roll! Patterned Roll Cakes”, has a blog were she has uploaded lots of fun and cute recipes for decorated roll cakes. 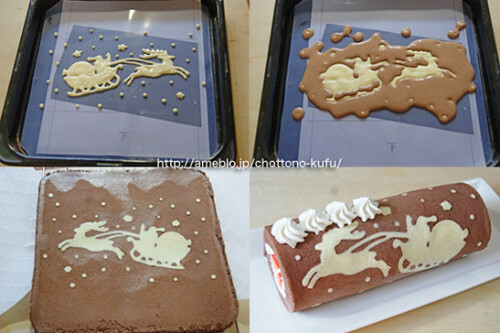 As it is written in Japanese you may not understand the details, but it seems you just fill a pastry bag with the batter for the pattern and draw that, bake it in the oven for a minute and a half, and then fill in the rest with the sponge cake batter. If it was a simple pattern, perhaps you could try making one too? Aww, these cakes are so perfect! I am taking that site to google translator because those cakes are the cutest things I’ve ever seen! I saw this book at a Japanese book store!! I only learn Japanese for 3 years only….& you are right… I totally can’t understand the details…. But I still want this book so bad!!! can i have the roll cake decorating recipe? thanks.